Many tourists who visit Bay City in historical interest are naturally drawn to our most visible and accessible attraction: the historic homes on Center Avenue. Also, the whole history of the town is laid out, in a manner of speaking, in Pine Ridge and Elm Lawn cemeteries where the headstones speak silent volumes through drifting fog, that is, if you know the tales that titillated the town in days gone bye. Last week we reviewed some of the attractions of Bay City and now, upon reflection, we realize it may take a few more columns to properly address the subject since there is so much to tell. My memory is jolted into activity each time I pass the attractions cited here; it is either a beneficial, or annoying, habit that I can't shake, having lived seven, nearly eight, decades amidst these memorable reminisces. A quirky industrial psychologist in a jumpsuit and rose-colored glasses marked me "living in the past" and not worthy of corporate promotion as a result. Glad in retrospect for his narrow-minded detraction, I plead guilty to being an inveterate dreamer who finds a story everywhere. Hell's Half Mile, from Sixth Street to First, is hard to beat for stories of historical import: Wenonah Park where the speculation village of 1837 drew abolitionist James G. Birney; where Harry Defoe started building boats; where Chippewa Indians camped in the 1929 Water Carnival that brought Olympic swimmer Johnny Weismiller to the hastily-devised pool on the site now occupied by the DoubleTree Hotel-Bay City Riverfront. The apartment building above the street-level stores on the east side of Water north of Fifth where once lived Annie Edson Taylor (no relation to our Edson destroyer namesake), the first person to go over Niagara Falls in a barrel (made sturdily in Salzburg) and live; the site of the former Water Street ferry dock where Fabian Joe Fournier was killed in 1875, leading to the Paul Bunyan legends; the notorious Bridge Block/Catacombs, now St. Laurent Bros. candy and nuts; and the 1932 arrest of the Bonnie & Clyde gang members above Bay City Auto Co. 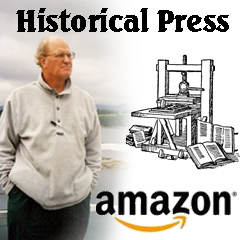 Longtime Bay City Times Police Reporter Tim Younkman has plowed new ground regarding the nefarious activities of a cast of historic Bay City actors who would rival Jack the Ripper days of London. He will expound on those often gruesome findings (that reportedly include a newly uncovered Third Street slasher) in September at an SVSU OLLI class we hear. But, moving on, with nods to the magnificent 1904 Pere Marquette Depot, the 1932 Art Nouveau Bay County Building and the Masonic temple of 1893 as well as the Consistory Cathedral of 1927, we head east on incredible Center Avenue. Perhaps one of the state's finest examples of a Second Empire house, the James Shearer residence at 701 Center, is notable in its new red dress; the First Presbyterian Church at Center and Jackson and the iconic Trinity Episcopal at Center and Grant are themselves history tours. My personal historical odyssey began at Trinity in 1947, age 9, when I wandered from my grandparents' Godfrey and Dora LaFramboise's home at Fifth and Grant to the front of the church in a curious trek. I have never forgotten the day, July 29, and being startled by the spectacle of a phalanx of smartly marching Knights Templars, arrayed in black suits with red capes, flashing silver swords on their shoulders, parading from the Consistory Cathedral. Their plumed hats, and their very name, hinted of a mysterious past. It was many years before my growing awareness of what I had seen dawned on me, recalling the poshly black-clad throng, the limousines, the grave faces -- it was the funeral of the city's most prominent financier, James E. Davidson. A few years ago my wife Dolores and I drove through the forests of upstate New York to visit Lake Placid, Jim Davidson's favorite summer haunt, and tracked down his death certificate just to say we had done it. Davidson's home on Center near Lincoln is gone to the wrecker's ball but those of his neighbors stand in silent tribute to the street rated Michigan's "most beautiful" in 1925. I allow as how it has lost little of its attractiveness lo these 90 years hence. Space limitations will not allow a house-by-house description so generalizations here will have to suffice unless you are on one of our infrequent tours. We point out the trend of lumber barons to shift to stone and brick building materials as the labor strife of the times and resulting fears of arson, grew. The Charles and Georgianna Curtiss home at 924 Center, a Queen Anne stone fortress, being the prime example. With Dale Wolicki's "Historic Architecture of Bay City" as a guide, we take the visitor through the architectural fads that evolved over the decades of Bay City's maturation from a frontier village to a full-blown "mansionville" complete with towering elms, maples and oaks creating a veritable tunnel of trees on the lawns. 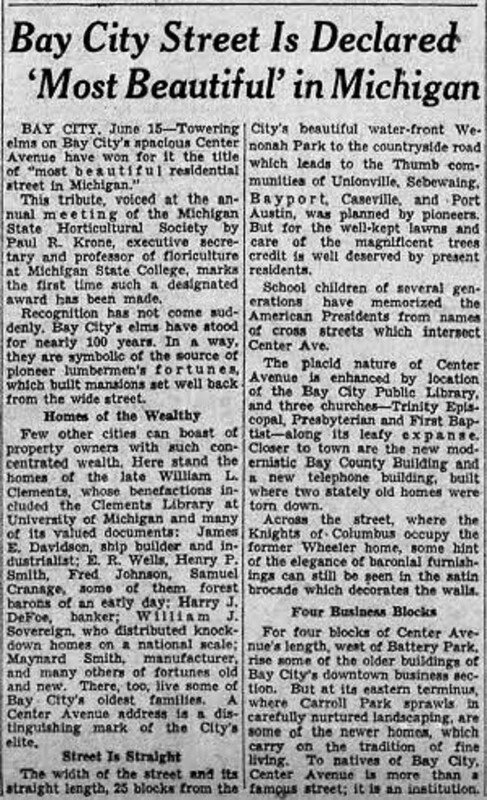 Queen Anne style homes like cracker king Whitney's at Lincoln; Dr. Stone's tiny office at McLellan; and the Merrill-Parker "pumpkin" house at 1911 Center, notable for the murder of its lumber baron owner, Franklin Eddy Parker, by Steve Madaj in 1916. The Romanesque eminence of the 1891 Chesborough home at 1515 Center, the Shingle style Courtright residence at 1812 Center, notable for its design by Philadelphia architect Wilson Eyre that incorporates a unique inglenook and semi-circular porch so attorney Morris Courtright could consult with clients outside. Numerous Center Avenue residences have so-called Romeo and Juliet balconies and most have third-floor ballrooms as well as servants' quarters. Tales of licentious happenings between the buxom maids of European descent and the privileged male heirs of the lumber barons have no place here, but you get my drift.